The Institute of Engineering IOE founded in 1930, is the first technical school of Nepal. In 1972, the Nepal Engineering Institute at Pulchowk and the Technical Training Institute at Thapathali were brought together under the umbrella of Tribhuvan University to constitute the Institute of Engineering. Besides producing low and tertiary level technicians, IOE runs professional diplomas, undergraduate, postgraduate and Ph.D. programs. The institute has four constituent and ten affiliated campuses all around Nepal. So How to fill up IOE entrance application form? Note Please subscribers to this site, we will notify you when Further notice is published about Entrance Exam Date, Admit Cards. You can get other engineering related contents too. 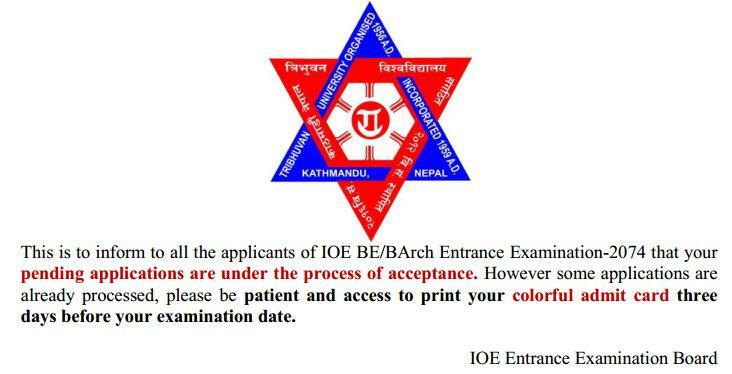 Institute of Engineering (IOE) has published notice for IOE Entrance Exam 2075. You can fill up the IOE Bank Voucher Starting from July 13. Where as online application can be filled up starting at 15th of July. You need at least C Grade in Every Subject, as Result has not yet been not published, this condition is applied from Grade 11. Here is a Informative blog post on IOE Entrance 2075 from Blogger Nepal IOE Entrance Exam 2075 / 2018. There are other Universities with engineering program with scholarship Check Engineering in Nepal, A Bachelor’s Degree. First of all you need Following Things Before Processing However you can come back and process again if you did not have the sufficient documents needed. You Should deposit an amount of Rs2000 at any branch of Siddhartha bank account no: 00915056064 from anywhere in Nepal. Siddhartha bank shall provide special voucher especially for IOE entrance applicant. Name should be of Applicant not of your parents who deposited the fund. You notice Name of Applicant Voucher number (printed on the voucher) Date of Birth in MM/DD/YYYY (month/day/year) format in AD are correct. Visit This link To Start Filling your Form http://entrance.ioe.edu.np/Home/StartRegistration You will Be Provided with Necessary instruction. You shall start your application generally 2/3 hrs later after getting bank voucher. And you cannot apply online without bank voucher. You can Process by Reading all the Process and Clicking next at the last of every Instruction page. I will Guide you on some Special field you may Confused or if any more you can Comment bellow for help. Voucher No. The Number Printed on the Voucher while depositing the fund. In the Middle Name Field you can need to next it empty if you don’t have. Contact no. Insert mobile no or Land Line with Area code. Email: fill the email address you use regularly. If some problems on your information IOE will contact you through Email. As i know. You need some Specific file format of the image so Check Change file format of the image. to change file extension else it will not accept your file. And you need two side of scan copy not both in one. You can cut using Paint in windows. Address information should be as in your citizenship card. (no Matter if your VDS Still exist or not). On SLC symbol no. insert the Letter too. And In collage Symbol no Use the latest one ie use take Back(Chance) exam of 11 You need to insert it. If you are New Select Waiting on Result Type If not Select passed and Fill Passed year and %. At last Insert captcha if Difficult you can select refresh. After submission, applicant will get a conformation page.Print this page and keep it with you. If not Printer on your PC you can save it as PDF File on your computer and Print it on Some shops. This page is mandatory to receive your admit card. If you are unable to print out the confirmation page after submission of your form, you can print it any time by entering your name and date of birth in the verification page. Thats all If you Save and Processed and you are not getting any Response or Some Unusual error message you can Find Review on http://entrance.ioe.edu.np/Students/Review you need to insert your Date of Birth Name and Identification no. If it Exist there you can Edit and Process if Now you are not on the System Need to Fill the Form again as new Registration. So as from the above image.. (Source IOE) you should wait until 3 days before the exam date. As image shown above, you need some information like Last Name, Date of Birth and Identification No. ( ie. citizenship card no or driving licence no.). Once you fill all these correct you get the link to your admit card. If you fill something wrong you will be redistricted to revised page. Or, you will be redirected to homepage if your request to early. ( before 3 days to exam). So after 3 days to exam follow that link and download that (it may be in image or jpg format) Print it using color printer. Then its done. Stay focused and study hard. If All Process is Done and you find Some information Wrong on confirmation page. You cannot edit and correct it Online, you have to contact entrance examination system at ICTC, Pulchowk. You have to pay Rs 50 at ICTC and put letter of request for correction. And you can also send the mail at entrance@ioe.edu.np by mentioning the correction required but make sure that the records were corrected as per your request. Comment box is always ready to help you. i have passed 12 with taking back and i have put regular symbol number in ioe form.is there problem on publishing result.if there is problem, i can correct it now. pkease suggest me, i m in problem. No. there will be no problem while publishing the IOE result as i know. But while admission process you may (or may not) need to correct it. I sent a mail to ioe. will inform if I get response. When will Ioe Result publish? Best up luck, Satish. There is nothing that you can’t trust TU with your data. Driving license can be the alternative. So either License or Citizenship is needed. Best of luck for the exam. I don’t have citizenship and i am a passed out student so can I use my 12 admit card or birth certificate for identification document? As I know you do need Citizenship as identification document. You can contact Institute of Engineering Pulchowk, Lalitpur Tel. 01-5521531 to know if you can use admit card as alternative. i have submitted my form but still i can’t print my admit card then what can i do? You need Last Name Date of Birth ( B.S. or A.D.) and Identification No. (ie your Citizenship no.) remember you are allowed to print your card just 3 day before the examination date. Is their necessary to have a citizen ship…. Yeh! or Any kind of ID verifications. You can use your Driving license and even Passport too. What is the criteria for filling the ioe form? Give me detail.means in which subject what grade should student have to fill ioe form. At least C Grade in Every Subject is required. Is class 11 result required to fill the form? Yes you need to provide your class 11 Result, and at least C grade in every subject is required. I don’t think it does matter if your date of birth is incorrect in voucher. But if your have errors on IOE form you cannot edit and correct it Online, you have to contact entrance examination system at ICTC, Pulchowk. You have to pay Rs 50 at ICTC and put letter of request for correction. And you can also send the mail at entrance@ioe.edu.np by mentioning the correction. What if slc grade marks is mistake in registration form? Do I need to correct it. There would be no problem, as you need to provide all the information during admission. But correcting would be best, Or at least send them email, informing this error. I had contacted IOE through email but got no response. Will inform If I got any update. Best of luck for Exam. I have filled NEB instead of HSEB. Is it necessary to correct it? And also the name of +2 my college is wrong I mean I write as sublime english school instead of sublime english boarding secondary school. Is it necessary to correct it? 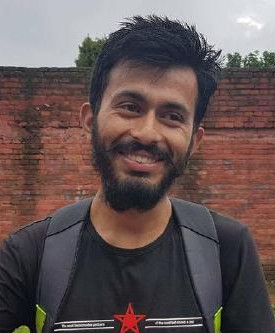 You should fill NEB instead of HSEB. Thanks for the comment, I will correct this post. There may not be any problem about that, as you need to provide all the information during admission. but correcting would be best. Or at lease send them email, informing this error. i downloaded pdf format of confirmation page but there is written that this is not my admit card. sir would you tell me how to get admit card? As mentioned in the Article How to Get IOE Admit Card You can download your admit card just 3 days before the exam day. We try to contact with IOE via email got no response, Better to contact via Phone yourself. How do we know if our form is accepted or not ? And thankyou so much for the info . You can view the status of your application form as mentioned on https://timeandupdate.com/2016/07/fill-ioe-entrance-application-form/#Review_IOE_Form_Status. Will my form be rejected or accepted? If you had filled your form with correct date you form will be accepted. Your basic informations should match with your documents. If you pass minimum requirements and everything goes right it will be accepted. My identification no. is incorrect. What should I do? You need to correct that information. You cannot edit your details online. You need to fill some application. Contact IOE 01-5521531 (Institute of Engineering Pulchowk, Lalitpur) to understand what action to be taken. During the form submission there was no option for the tribe document to be inserted.If we have the document how to submit it now? Can we refill the form or what? If that documents are required for administration you need to provide then during college administration. And there is no way to edit the information after submission. And you need not to refill the form. Contact IOE to be sure of everything.